The death of Hull student Libby Squire is being treated as "a potential homicide", Humberside Police has said. 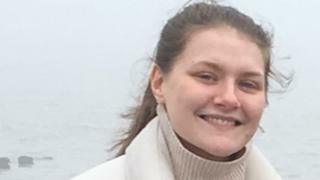 The 21-year-old's body was found in the Humber estuary on Wednesday, seven weeks after she went missing following a night out on 1 February. Detectives said she could have been killed but "would not be releasing results of a post-mortem examination for investigative reasons". Det Supt Martin Smalley said "one man remains under investigation". He said: "In regards to our investigation, while we have considered throughout the missing person inquiry that Libby may have come to some harm, Libby's death and the recovery of her body now leads us to solely investigate as a potential homicide. Det Supt Smalley said specially trained officers were continuing to support Ms Squire's family. "Our thoughts remain today with Libby's family and friends at this incredibly sad and devastating time for them," he said. "Libby captured the hearts of not just the people in Hull, but across the country, and as I have said before, the support shown has been overwhelming and my sincerest thanks to absolutely everyone who has been involved." Libby's body was recovered at around 15:30 GMT on Wednesday close to Spurn Point and taken to Grimsby Docks. A major police inquiry saw hundreds of officers and about 50 detectives search for the student. On the night of her disappearance, police believe Ms Squire got a taxi at the Welly Club music venue before arriving at her student house in Wellesley Avenue at about 23:30 on 31 January, where her mobile phone was found. They think she did not enter the house and have said her phone "has not provided any further insight as to her movements that night". The bench has become a focal point for those wishing to remember Ms Squire, from High Wycombe, Buckinghamshire, and floral tributes have been left at the site.